Self-catering apartment with 2 bedrooms and 2 bathrooms. In a wonderful quiet location outside the fishing village of Burgau with stunning sea views and a private terrace with sun loungers and barbecue. There is a large pool (11 x 5 m) for exclusive use by the two apartments. Free Wi-Fi access, TV, mountain bikes, table tennis and body boards. Walk to the local beach with bar and restaurant. A rental car is due to the quiet location. Very spacious apartment with a well equipped kitchen and a very nice terrace with a view to the ocean. Nothing too luxurious though if that's what you are looking for. The pool area is absolutely stunning surrounded by beautiful flowers and palm trees. The apartment is very well situated close to the west coast with big sea cliffs and big beaches with fine sand and big waves. It's also close to the south coast with their spectacular beaches with caves and clear waters. There is a very nice beach bar in walking distance from the villa where you can party in the night and 2 supermarkets in approx. 5 km distance. The only thing I did not like about the area is that some of the villas around there seem to be abandoned...they were probably built just before the economic crisis and nobody bought them. They were still in a pretty good shape though. good recommendations. They have offered to buy basic food items for us when they heart we were arriving at 9 pm. Apart from this we had a bottle of wine and 2 beers in the fridge as a welcome gift. We had a great time there and we'll be back some time. Thank you Sorin. Yes, unfortunately the developer went out of business and some villas remain empty or unfinished. They are now owned by the banks who do not seem in any hurry to sell them. Looking forward to greeting you again. 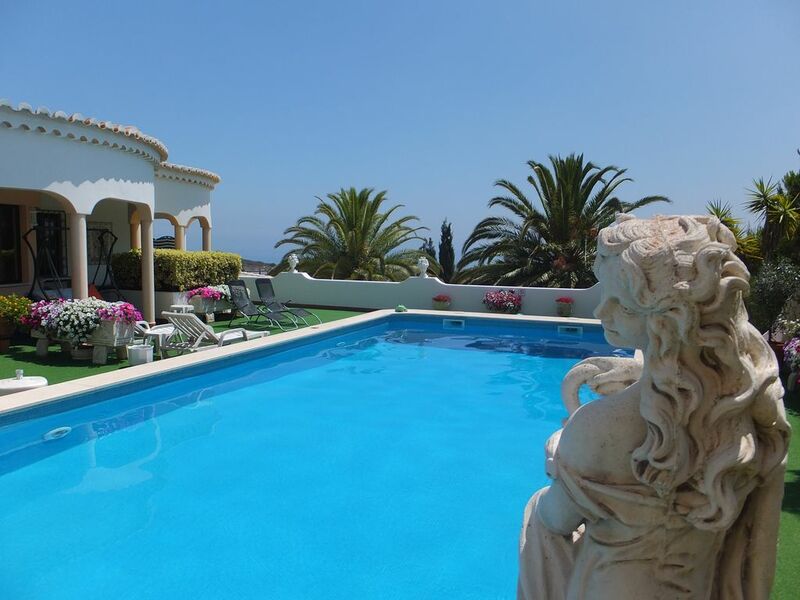 Lovely apartment and pool, super location, very friendly and helpful owners. Great holiday!!!! Moradia Miramar was a great location to explore the Western Algarve from. We were there at the end of July 2018 for 11 days. Excellent apartment, equipped with pretty much everything you could need, plenty of room, very comfortable with its own seating area that is sunny throughout most of the day and has a lovely sea view. The area itself is very quiet, hardly a car or pedestrian passes by all day. Great to have the swimming pool available whenever we wanted, it is plenty big enough and has more than enough seating for both apartments to use it at the same time without any problems. A very short drive or 10-15 minute walk to the nearest beach bar on a very small 'Blue Flag' beach, great for a drink or food. A slightly longer drive takes you into the small town Burgau, another very nice beach and plenty of bars and restaurants with a wide selection of different foods on offer from traditional local dishes to an excellent pizza restaurant that also does takeaway, there is even an Indian Restaurant if that is your cup of tea. Everywhere we went the prices were good for the food you got, and the service was generally pretty good. Burgau is a relatively quite resort, certainly not an 18-30 destination! A car is pretty much a must, we hired a car from Faro Airport (just over an hours drive away from the apartment). Over the 11 days we covered over 500 miles exploring the Algarve southern coastline from Lagos across to Sagres on the south-west tip of Portugal and up the West coast up as far as Carrapateira. So many stunning beaches, many not at all busy even in late July. We also had two days when we went inland to the main town of Monchique and the nearby Spa village of Caldas de Monchique both of which are well worth a visit, and while in the area do go to Foia, the highest point in the Algarve at over 900m above sea level, the views are fantastic if you pick the right weather! Finally the apartment owners, Robert and Dawn are great, always friendly, helpful and on hand should you need any help or advice, but never intrusive. Overall a really lovely holiday, we wish we had stayed there longer! The apartment was great, very clean and exceeded our expectations. The hosts Robert & Dawn were lovely even helping me pay a parking fine on line. They provided an information folder for the area showing and describing the amenities, both local and afar. We only used the pool once as we are not pool people but it was a lovely pool. We played table tennis a few times and read some of the books provided. Would definitely recommend a stay here. Owners cannot do more for you. Delighted to recommend it and would be happy to return. We thoroughly enjoyed our stay in the apartment which is spacious & comfortable. Robert & Dawn are very helpful but discrete, so we felt we had our own space & sole use of the beautiful pool. It was an ideal base, quiet & peaceful, particularly in August, when everywhere is so busy & provided great access to all the Algarve. The apartment is quite spacious and nicely furnished, very clean. Everything one could possibly need is available. You can have your breakfast with a beautiful view of the sea. Except for one short swim, we did not use the pool area because of the unusually cold weather, but it is very nice. The hosts Robert and Dawn are very cordial and very helpful. It is a 10 min bike ride to the next village Burgau, which for us was just the right size. It does have a tourist infrastructure with a choice of good restaurants and bars, but does not feel disagreeably touristy. There are a lot of very beautiful beaches nearby, although the nearest one Cabana is not so ideal. Thank you Susanne for your very nice review. We are glad you enjoyed your stay. Hier sind unsere Preise pro Woche, pro Apartment für 2 Personen. Hinzu kommen die Kosten für ein Zustellbett für die dritte Person (50 EUR), sowie die Stromkosten für Klimaanlage-, bzw. Heizungsbenutzung.